Watercolour of a mosque at Rajmahal from 'Views by Seeta Ram from Malda to Gunga Pursaad Vol. II' produced for Lord Moira, afterwards the Marquess of Hastings, by Sita Ram between 1817-21. Marquess of Hastings, the Governor-General of Bengal and the Commander-in-Chief (r.1813-23), was accompanied by artist Sita Ram (flourished c.1810-22) to illustrate his expedition to Bengal in 1817 and his convalescent tour in the Rajmahal Hills in the winter of 1820-21. 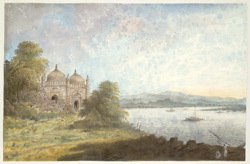 Idealised view of the Akbari mosque at Rajmahal overlooking the river Ganges. Rajmahal, located along the right bank of the Ganges in Bihar, was chosen in 1592 as the capital of Bengal by Man Singh, a Rajput general who worked for Mughal Emperor Akbar (r.1556-1605). Rajmahal remained the capital until 1607, when it was shifted to Dacca. Sultan Shuja, the governor of Bengal, moved the capital back to Rajmahal in 1639, though by 1707 it was shifted again, this time to Murshidabad.